Took a half day at work today, heading up through the West entrance. Yeah, south is open, but there was an “Instameet” at Madison tonight, sort of positioning for that. 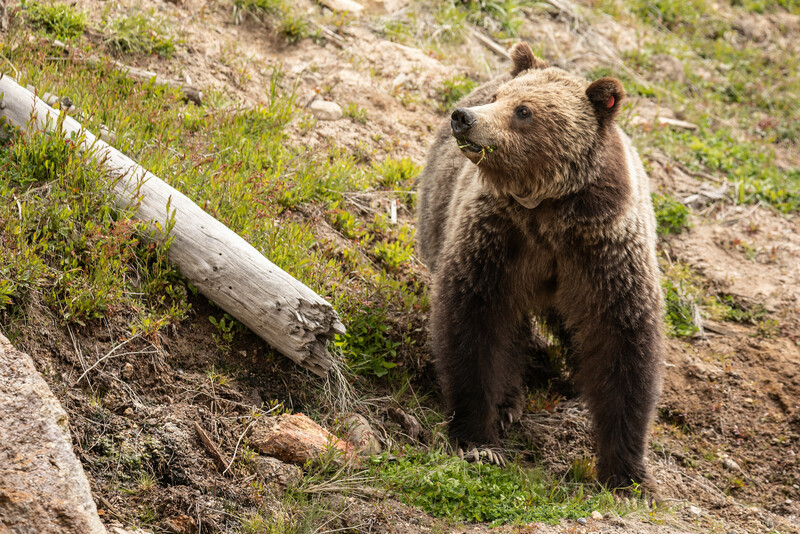 Also there have been reports of reliable grizzly sightings between Beryl Spring and Roaring Mountain. Through the west gate by 4ish, I decided to work my way towards Canyon since that’s my campsite for the weekend. 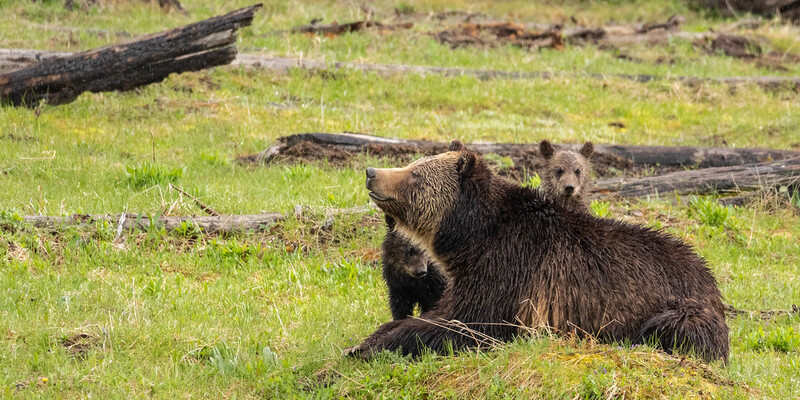 This also passes through the grizzly hot spots, and it turned out to prove fruitful for the the sow w/ cubs. They were all in a meadow about one mile north of Beryl Spring. Plenty of grazing and sleeping. It’s pushing close to 6:30 now…not going to make it to Canyon. Time to push back to Madison and meet-up with some new people. 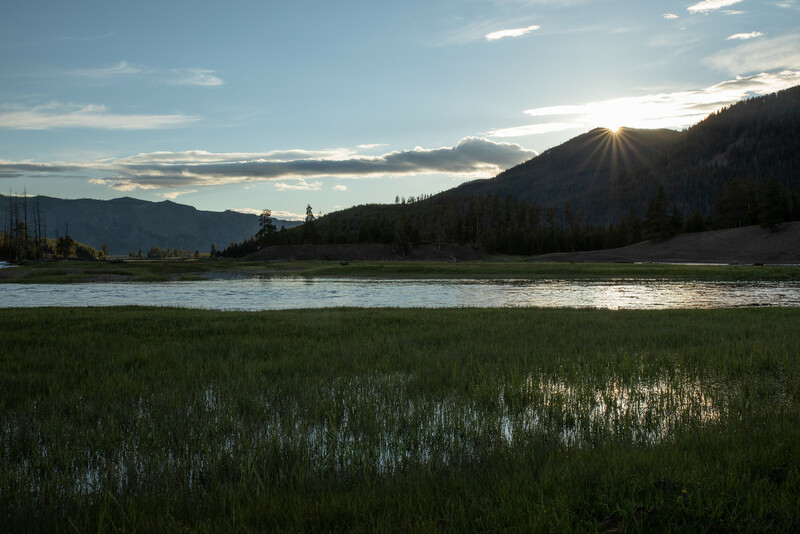 And enjoy a sunset on Madison River of course. Now after dark it’s time to haul to Canyon. 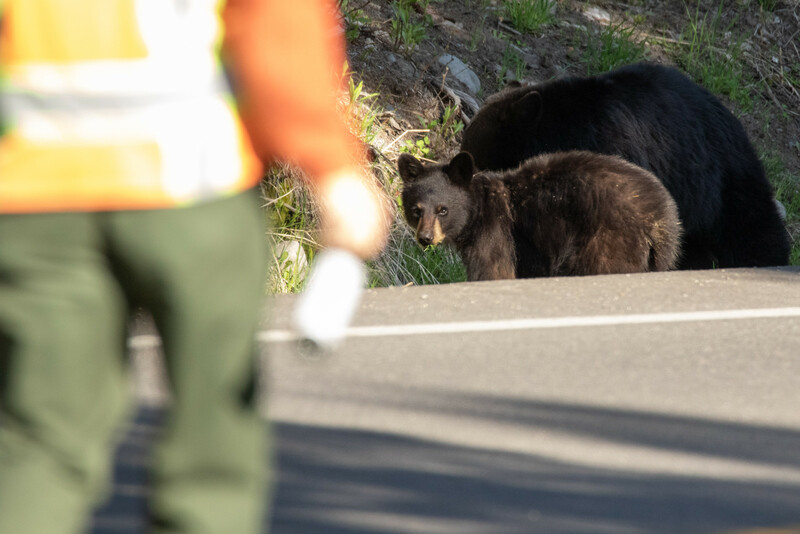 The bear jam was still present north of Beryl Spring…and the sow w/ cubs were right on the roadside! Those tiny cubs are hard to see in the daytime let alone after dark. I hope they don’t always hang around this close to the road. Checking in right around 10pm, the Canyon CG is still buried in snow. I pitched my tent right by the pullout to avoid most of it. The fire-grate was nowhere to be seen. Up and out by 5am. I wanted to see if the Tower bears were out. One of the sows was sleeping at the base of a tree at Calcite Springs. I fell asleep myself waiting for them to stir. The sun was pretty high by the time they started moving and went deeper into the trees, foiling any real photo opportunities. Oh well. Back to Canyon for breakfast and then over to the west side to check for grizzlies. The sow w/ older cub was out north of Norris. She gets way too close to the boardwalk and then disappears over the hillside. I drove south to check for the other sow…nada. 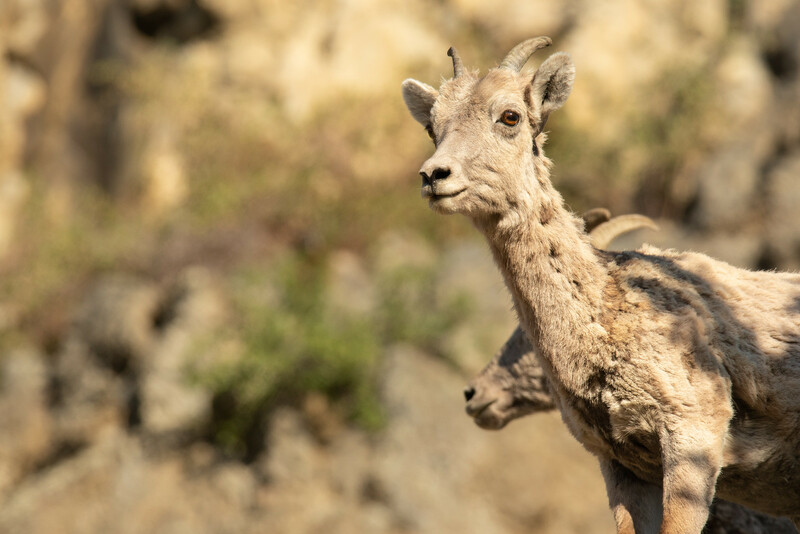 Back north where this one pops out of the woods again and follows the roadside opposite from Gibbon River. If you view these photos in my portfolio, you can hit the ‘i’ icon to see the camera settings. This image was 270mm, but don’t freak out. These two followed the road for some time and everyone stayed in their vehicles. Once the roadside led to a meadow, they wondered into the distance. The early afternoon is to be spent outside the park and at the GWDC. They did a mock campsite this weekend where a campsite (w/ food) is setup for the grizzly bears. 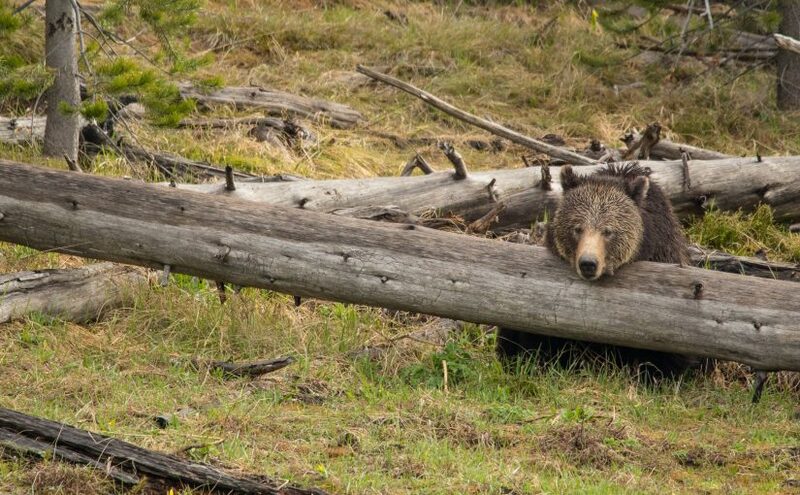 It’s an overly gratuitous way to demonstrate how not to camp in bear country. And I bet if you are skimming through the images, you stopped here. 🙂 Head on over here to find out what happened to that campsite. 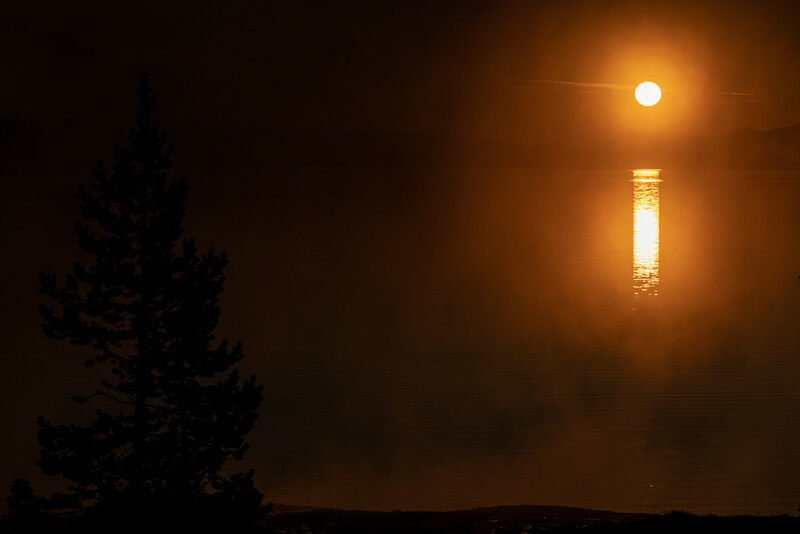 Back in the park, there was no grizzly activity on the Norris side, so it’s over to Hayden Valley for the evening. There is elk scattered about, seemingly for calving season. Other misc bison and a few deer. Back to Calcite Springs in the A.M. with no black bears in sight. Closer to Tower Falls, there was quite a bit of rock on the road. A quick glance directly overhead shed some light on the cause. 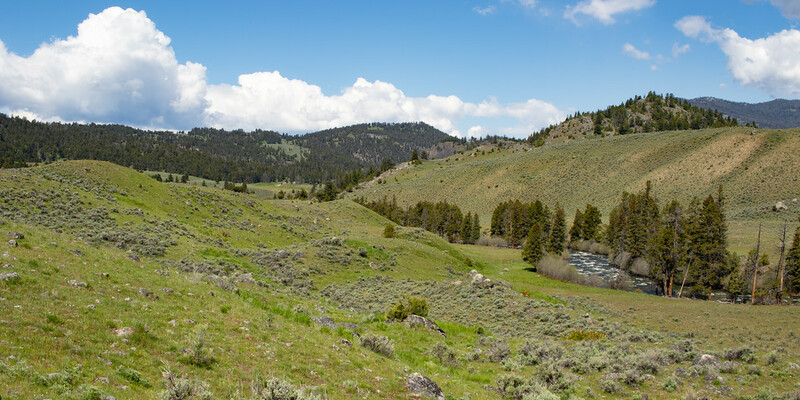 Today is the first of two hikes…Hellroaring Trail to the Yellowstone River / Hellroaring Creek confluence. It was uneventful, aside from the amazing weather. 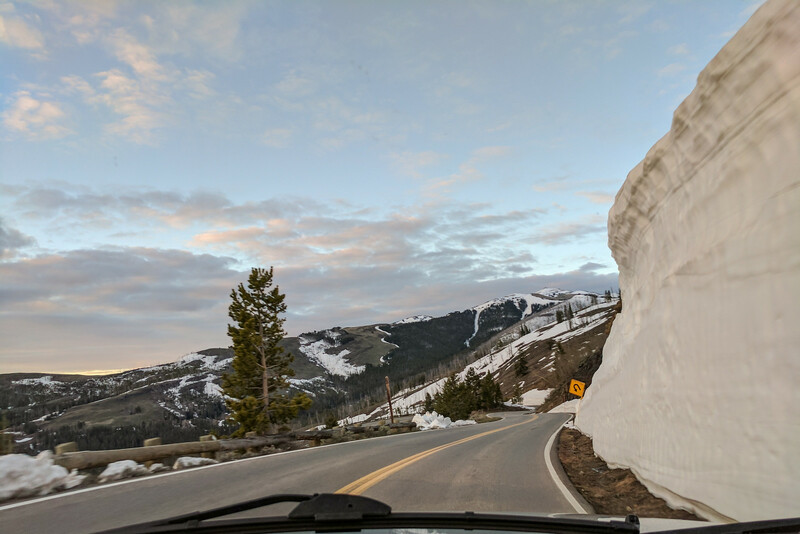 After the hike, Dunraven Pass was closed due to an alleged rock-slide. So it’s a drive all the way around the northern loop. Wouldn’t hurt to look for those grizzlies anyway. 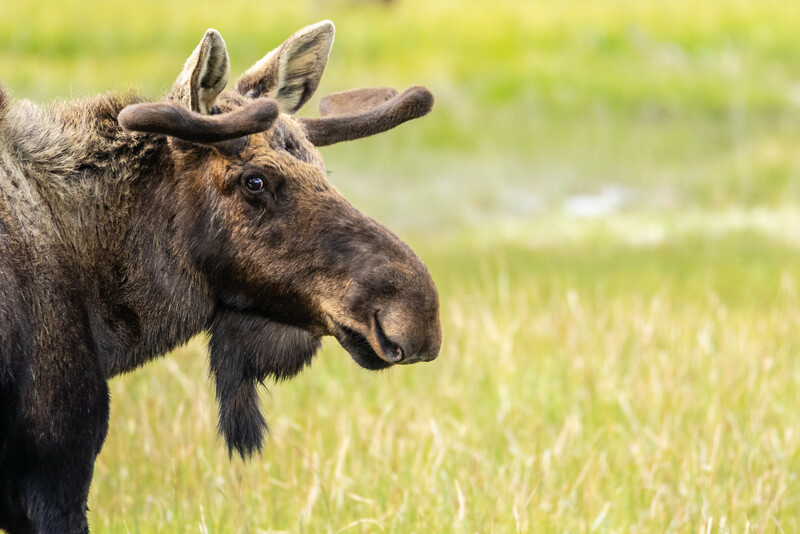 They weren’t around, although there was a moose near Norris. The current weather was partly cloudy, so it took a while to time the moose looking up with a cloud passing overhead. Otherwise it was super harsh midday sun. Back in Hayden Valley for the evening. 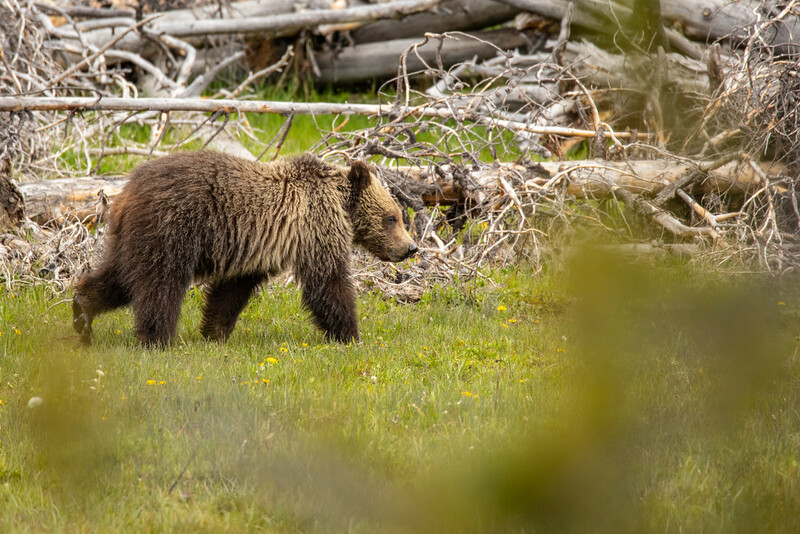 The weather was a little variable, but we had a pair of grizzlies way back on the west side, almost to the far ridge-line. Clearly scoping distance. Up at 5am to head over to Calcite Springs again. 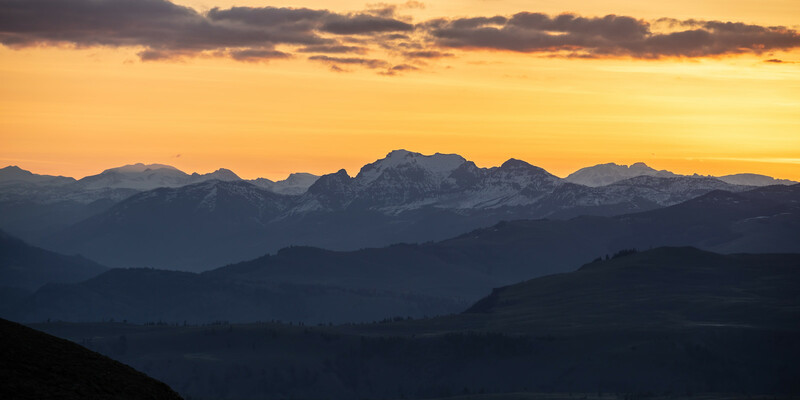 Dunraven pass greeted me with a nice sunrise. No action at Calcite Springs…at first. One of the sows stirred by 9am. They hung around the sections of dead-fall and lazily crossed the road, creating a bit of a jam. Later that morning I had to break down camp to be out by 11am, so it’s back to Canyon for breakfast and check-out. Then it’s time to head back north to hike part of Specimen Ridge. I make it all the way to find bears at my trail head. But they were on the move, so it took only a few minutes to move on out of the area. 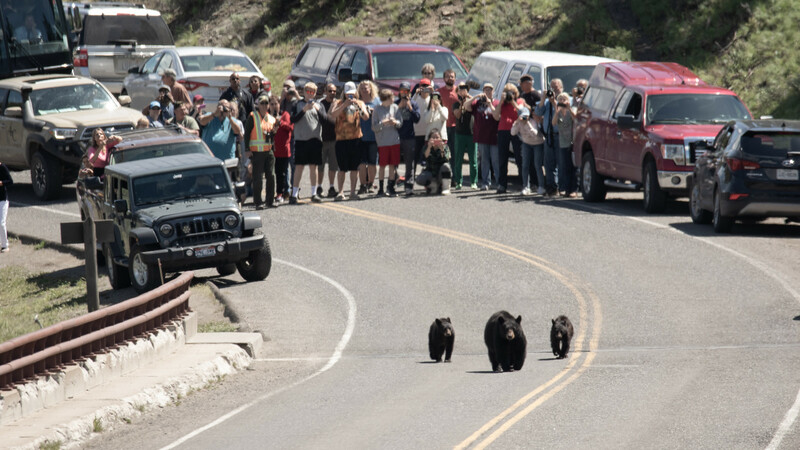 It looked like the bears were headed for the bridge. So instead of hitting the trail, I decided to scamper down to the other side to catch the crossing. As far as getting a good photo goes, everything is wrong here. It’s midday with super harsh lighting almost directly overhead. Combined with the road surface will create some nasty heat wave distortion. The sun is also every so slightly behind the subjects (bears), so their fronts are in shadow. But who cares, I wanted the bears + crowds, and this is what it took to get it. Now that the bears are out of the area, time to leave the car for a bit. This section of the ridge-line is super cool, providing a unique view of Tower Falls. Then it’s back to Hayden Valley for one last attempt to see any of the Wapiti wolves. Third time’s the charm, right? Not this time. 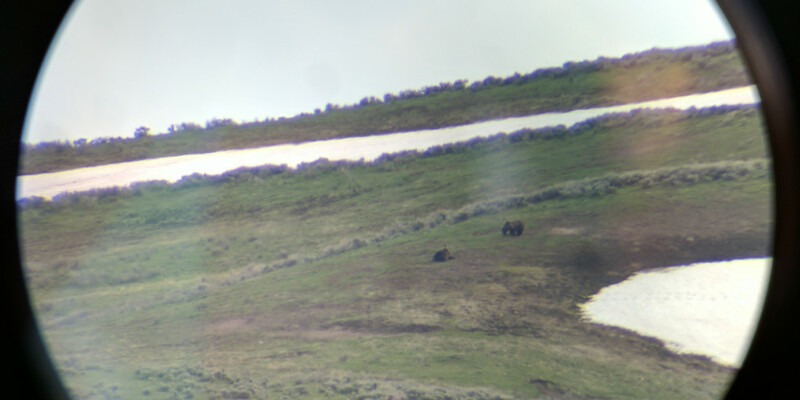 We were all just left with 4 grizzly bears out at scoping distance. 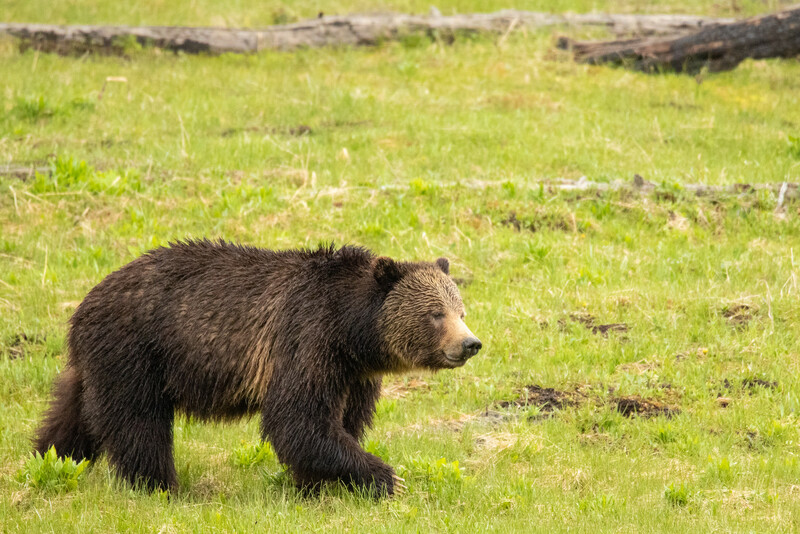 Bit I nitpick…for anyone that’s never seen a bear, it was a great evening to have so many of them in view. 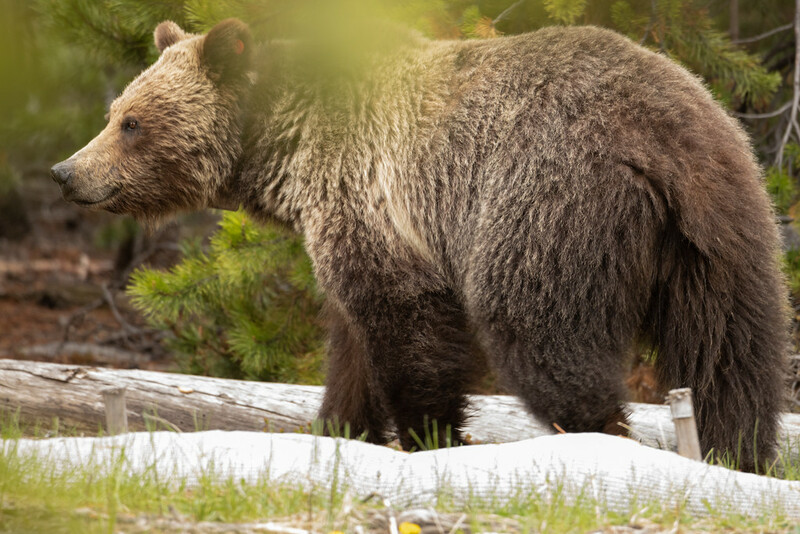 Total unique bears for the weekend: 4 grizzlies in Hayden Valley, 3 grizzlies (sow/cubs) near Beryl Spring, 2 grizzlies (sow/cub) near Norris, 3 black bears (sow/cubs) in Calcite, 3 black bears (sow/cubs) near Yellowstone Bridge. Tonight is a brief stay at Bridge Bay. Up at 5am, but unfortunately it’s to haul to work….with maybe a brief stop or two for the sunrise. 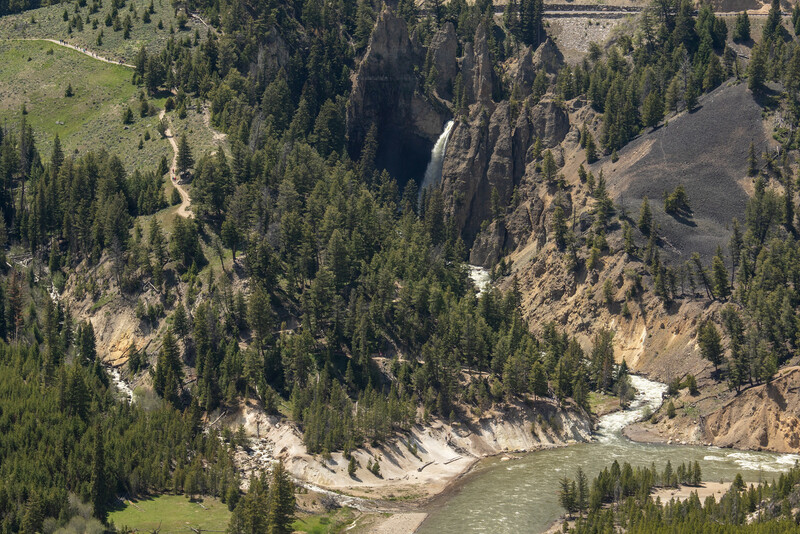 Next Next post: Yellowstone & GYE June 9 – 11: Summer?